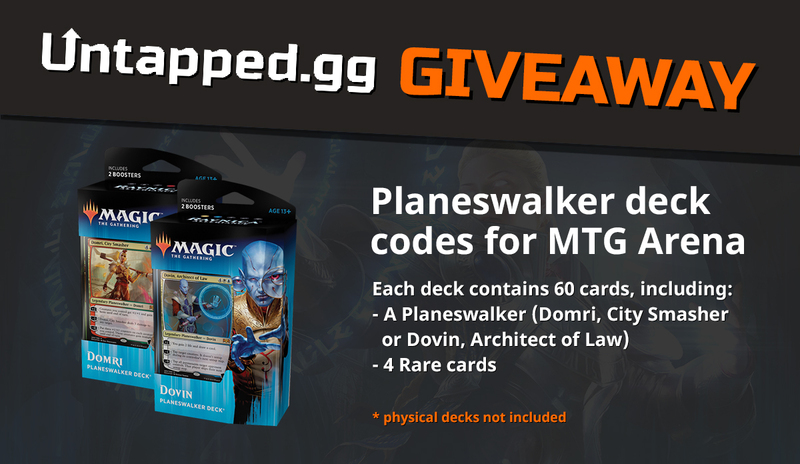 ThinkGiveaways - Enter for a chance to win 1 of 2 Ravnica Allegiance's Planeswalker Decks for MTG Arena. There will be 60 virtual non-physical cards in each deck. Enter for a chance to win 1 of 2 Ravnica Allegiance's Planeswalker Decks for MTG Arena. There will be 60 virtual non-physical cards in each deck. We're giving away two deck codes for MTG Arena to celebrate the start of the OPEN BETA of our Companion App, which you can download at untapped.gg Each code allows you to redeem one of Ravnica Allegiance's Planeswalker decks (Domri RG or Dovin UW), each with a Planeswalker and 4 rare cards. Physical decks not included.